Oh, how I love thee; you make me weak in the knees. I have come to rely upon your ever-growing selection of soul-satisfying goods. Although your produce is often lacking, I find an immeasurable amount of joy in the many packaged goods that you offer. The low prices, the lack of gut-wrenching additives, and the forever-positive demeanor of your staff are what keep me coming back to you, time and time again. If I could buy you a bouquet of roses to prove my love for you, I would... but you already greet me with them upon my arrival, each and every time. But what I adore the most is that you provide me comfort in the most trying of hours. Your Chai spice latte mix helps break up the brain fog that mornings generally bestow upon me. Such a sweet nectar, it is. The perfect blend of warmth, comfort, and fullness that my body craves during the cold dark early hours of the day. And in the evenings, after my mind and body have been hardened by the day's activities, I find the same comfort in your tonic water when paired with one of my many botanic spirits. (Now, let's be honest - I do believe the spirits are doing much of the work, but the tonic is a suitable companion in it's own right!) One simply cannot deny the reality of these simple pleasures. Even on the shortest of visits, I find something new to admire about you. And yes, I am aware that you have many admirers, but I do believe that my love for you will never die. Brought to you in silliness, in light of tomorrow's "holiday". I'm serious though, their chai latte mix is AWESOME (and so much cheaper than *bucks!) and I was so very pleased to see that they recently started carrying tonic water, as it is nearly impossible to find corn syrup-free tonic anywhere around here. 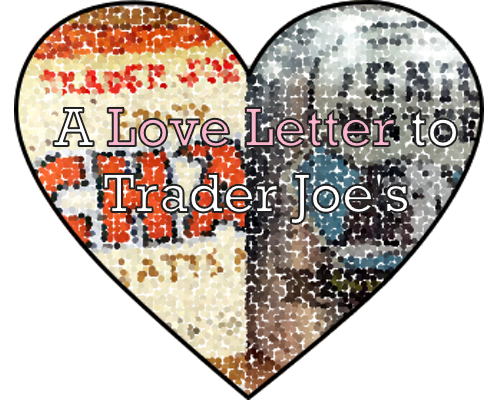 Trader Joe's gets two giant thumbs up in my book!